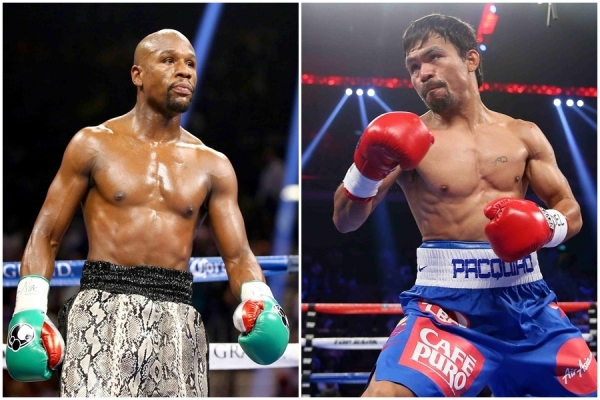 Floyd Mayweather, Jr. and Manny Pacquiao will fight on May 2nd at the MGM Grand in Las Vegas. I can’t wait, and guess what: y’all can’t wait too. I know a lot of y’all are mad that this fight too five years too long to happen. It was supposed to have gone down when both fighters were in their prime. Mayweather was schooling boxers in the ring with his defensive wizardry and speed. Pacquiao took out fighters with his unique blend of power and speed. It was only a matter of time that fans would clamor for both fighters to get in the ring and settle the “Best Pound-for-Pound” debate once and for all. However, a one thing got in the way: the method of drug testing in the lead-up to the fight. Mayweather demanded random blood and urine testing and Pacquiao declined to accept the specific protocol Mayweather wanted. As a result, the deal fell apart. Pacquiao also sued Mayweather for defamation for accusing him of using performance-enhancing drugs; the case was eventually settled out of court, but the bad blood remained on both sides for years. But on February 20, 2015, the fight that boxing fans young and old had been clamoring for had finally materialized. Props to Mayweather for not budging off the May 2nd date and working with Pacquiao to ensure that the fight would become reality. Props to Pacquiao for staying aggressive to force Mayweather to set the fight up and for being humble to negotiate and accept the terms. And perhaps most importantly, props to promoter Bob Arum for staying the hell out of the way. This fight may have been five years too late, but one thing is for certain: both Floyd and Pacquiao are STILL the two best pound-for-pound boxers in the world. And deny it all you want: most of y’all are going to at least tune in to that fight on May 2nd.